From a generic point of view, in .NET Core we called these type of tasks Hosted Services, because they are services/logic that you host within your host/application/microservice. Note that in this case, the hosted service simply means a class with the background task logic. Since .NET Core 2.0, the framework provides a new interface named IHostedService helping you to easily implement hosted services. The basic idea is that you can register multiple background tasks (hosted services), that run in the background while your web host or host is running, as shown in the image 6-26. A WebHost (base class implementing IWebHost) in ASP.NET Core 2.0 is the infrastructure artifact you use to provide HTTP server features to your process, such as if you are implementing an MVC web app or Web API service. It provides all the new infrastructure goodness in ASP.NET Core, enabling you to use dependency injection, insert middlewares in the request pipeline, etc. and precisely use these IHostedServices for background tasks. A Host (base class implementing IHost) was introduced in .NET Core 2.1. Basically, a Host allows you to have a similar infrastructure than what you have with WebHost (dependency injection, hosted services, etc. ), but in this case, you just want to have a simple and lighter process as the host, with nothing related to MVC, Web API or HTTP server features. Therefore, you can choose and either create a specialized host-process with IHost to handle the hosted services and nothing else, such a microservice made just for hosting the IHostedServices, or you can alternatively extend an existing ASP.NET Core WebHost, such as an existing ASP.NET Core Web API or MVC app. Each approach has pros and cons depending on your business and scalability needs. The bottom line is basically that if your background tasks have nothing to do with HTTP (IWebHost) you should use IHost. A background task polling a database looking for changes. A background task started with Task.Run(). The way you add one or multiple IHostedServices into your WebHost or Host is by registering them up through the standard DI (dependency injection) in an ASP.NET Core WebHost (or in a Host in .NET Core 2.1 and above). Basically, you have to register the hosted services within the familiar ConfigureServices() method of the Startup class, as in the following code from a typical ASP.NET WebHost. You could go ahead and create your custom hosted service class from scratch and implement the IHostedService, as you need to do when using .NET Core 2.0. However, since most background tasks will have similar needs in regard to the cancellation tokens management and other typical operations, there is a convenient abstract base class you can derive from, named BackgroundService (available since .NET Core 2.1). That class provides the main work needed to set up the background task. The next code is the abstract BackgroundService base class as implemented in .NET Core. In this specific case for eShopOnContainers, it's executing an application method that's querying a database table looking for orders with a specific state and when applying changes, it is publishing integration events through the event bus (underneath it can be using RabbitMQ or Azure Service Bus). 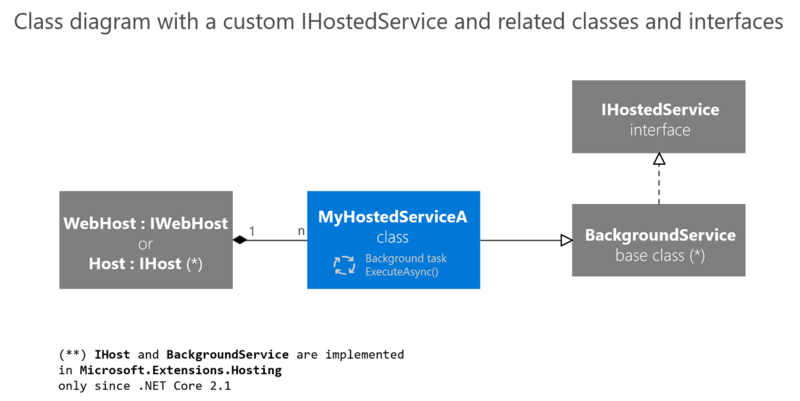 The following image shows a visual summary of the classes and interfaced involved when implementing IHostedServices. It is important to note that the way you deploy your ASP.NET Core WebHost or .NET Core Host might impact the final solution. For instance, if you deploy your WebHost on IIS or a regular Azure App Service, your host can be shut down because of app pool recycles. But if you are deploying your host as a container into an orchestrator like Kubernetes or Service Fabric, you can control the assured number of live instances of your host. In addition, you could consider other approaches in the cloud especially made for these scenarios, like Azure Functions. Finally, if you need the service to be running all the time and are deploying on a Windows Server you could use a Windows Service. The IHostedService interface provides a convenient way to start background tasks in an ASP.NET Core web application (in .NET Core 2.0) or in any process/host (starting in .NET Core 2.1 with IHost). Its main benefit is the opportunity you get with the graceful cancellation to clean-up code of your background tasks when the host itself is shutting down.